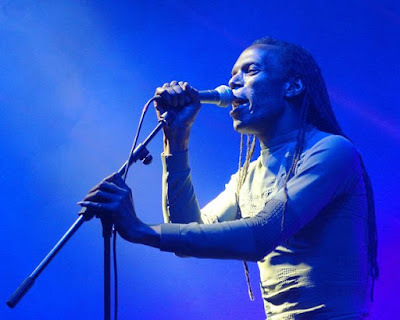 Earlier this week, a video titled "Ranking Roger "Wha'ppen" was posted on The Beat featuring Ranking Roger's YouTube channel of Roger being interviewed by music journalist Daniel Rachel (whose book Walls Come Tumbling Down contains the best oral history of 2 Tone around). During their chat in his home, Roger revealed that after his stroke last August, his doctors discovered that he had two brain tumors and lung cancer (which forced the cancellation of planned Beat tours of the US and UK). One of the tumors had to be removed immediately; the second was removed later, after he had experienced a seizure; and he is now undergoing two years of immunotherapy treatment for the cancer in his lungs. In this remarkably candid and affecting conversation, Roger talks about how fortunate he's been to be an entertainer whose job brings so much happiness to people; how grateful he is for his fans' expressions of support during his illness; and the prospect of facing his own mortality. Recorded before his stroke and subsequent health issues, the second album from The Beat featuring Ranking Roger titled Public Confidential is being released on February 1st, 2019 and already has been very favorably reviewed in Mojo (I pre-ordered my copy today and will post a review soon after I receive it). Here's the video for the fantastic lead track off the album, "Maniac." Roger also has been working on his forthcoming autobiography, which focuses on the early days of The Beat. Roger's been on doctor's orders to rest for six months, but hopes/intends to be well enough to participate in some of 2 Tone's 40th anniversary concerts and events this year. He noted that there's nothing physically wrong that would prevent him from singing, he just probably won't be able to run around the stage with as much incredible energy and spirit as he has in the past. We wish him all the best as he undergoes his treatment and very much hope that he will be in enough good health soon to be able to perform on stage and share his joy, love, and unity once again with his fans. In the short span of watching that video, I went from being absolutely gutted by all of the sad and shocking news, to feeling hugely inspired by Roger's positive attitude and outlook. He's obviously got a rough road ahead of him, but I truly feel that he's going to make it, and that he'll be around to share his music with us for a long time to come. He's always been one of the good guys, one of the true gents, and if thoughts and prayers ever manage to do anything, he's got mine. Plenty. Funnily enough, I'm listening to the new album right now, for the first time, as I type this, and it's every bit as good as anything he's given us before. Solid so far -- great songs, great performances, and great production. You can't ask for more than that. Will be looking forward to your review -- I can't imagine the slightest bit of disappointment! ps... Many thanks also for the heads-up regarding Daniel Rachel's Walls Come Tumbling Down, which somehow escaped my attention. Duly added to my [impossibly long] To-Order list on Amazon UK, and shifted to the to spot! You're going to love "Walls Come Tumbling Down"! Enjoy it! Duff Review: Subject A "Writers Eyes"